THE SKINNY: Regular Beauty Test Dummies readers know that I am not a fan of lipstick. But it went on smooth and light. And the color was fantastic! (I used Fair-Light.) I could not have been happier. 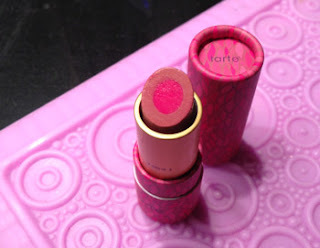 Tarte claims this formula has complexion-enhancing pigments (whatever they are) but the color matched my skin tone beautifully and my lips felt great and soft all day. None of that tight, sticky feeling from some other lipsticks. KEEP OR TOSS: Keep. It is great to have a lipstick that I like ... and will actually use! CHECK IT OUT: This lipstick comes in two shades Fair-Light and Medium-Tan but seems to only be available through QVC. You might want to stock up now!